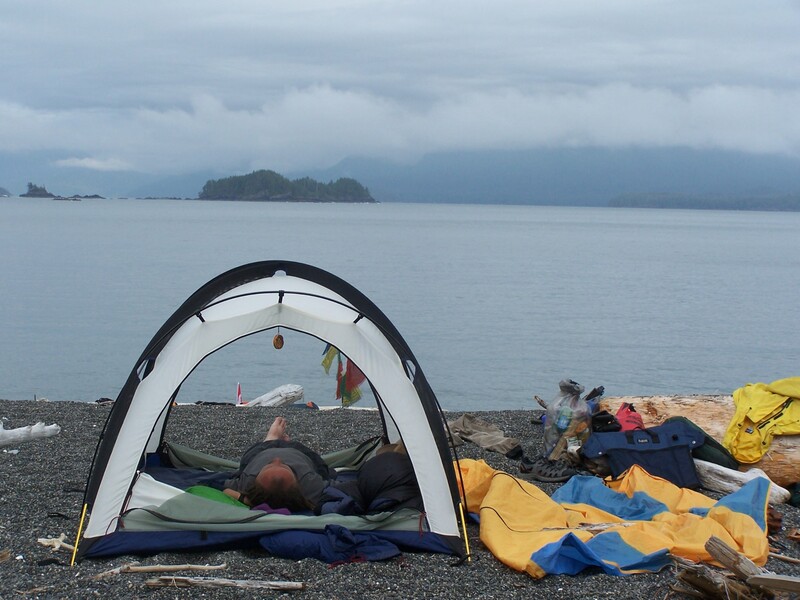 Held in camp for a week in Clayoquot Sound in between heavy rains and high winds. At least we didn’t run out of fresh water to drink. Now it is not all bad news. During all the kayaking trips I have done to the outer coast of Vancouver Island in the summer months I can count on the fingers of both my hands how many clear, sunny and perfectly windless days there were. It keeps things simple that way. More rain than sunshine makes preparing for a trip a lot simpler. Check lists begin with rain gear, coats, rainpants, tarps before PFD’s, paddles, and even food. Preparing for the worst and being pleasantly surprised when the worst does not happen is my kayaking motto, that and bring more coffee! And holding onto a cup of rainwater coffee under a tarp beside your tent while sitting on a damp log breathing in the humidity is pure joy. So, onto the tips section now that I have you feeling dreary at the prospects of your summer paddling adventure being one of sogginess. It is not that bad and by no means do you have to spend all of your time on rainy days sulking inside your tent. There is too much to do, even if the conditions don’t allow you to get off the beach for a rainy day paddle. I advise those by the way, as once you are wet, you will not get any wetter. Often times the rainy weather will accompany a calm on the water. Low clouds and drizzle drumming in a hush on your deck while you paddle through an environment of muted colours and your paddle swishes through the raindrop dappled seas. See, that sounds good, huh. Okay, so not for every one, but it is meant to be an adventure, right? Tip number one is to get your outdoorsy skills de-rusted and dusted off during dry good weather days at home. Go camping in your backyard and practice, practice, practice. The first thing to do is set up your home in the outdoors. When landing your kayak at your desired camp have your wet weather stuff packed in such a way that it is the first thing you grab out of the boat. Starting with a tarp. Speed will be at the essence here as you will be well insulated from the chill when paddling in the kayak, but as soon as you are out in the open air it is easy to get cold fast. Get a shelter up as quickly as you can. Find a suitable spot for your tent, but string up your tarp(s) first in such a way as to create a wind break as well as a roof over your head. The tarp will create a place for you to set up your tent, or hammock and stay dry doing so. Consider a shelter for your tent area, and another farther away for your kitchen space. Occasionally tighten up the tarp to avoid puddling and that unintentional dumping of a tarp-load of rain water on your head. Now it is time to get that tent set up. Go for high ground so you don’t end up in a puddle. If your tent comes with a ground sheet, use it, or a spare tarp to help create a barrier between you and the wet ground. Once the tent is up toss in your camp clothing bags and set out your sleeping pad and bag. Do this inside your tent to avoid your sleeping bag getting wet. Now get that stove going to brew up a cup. 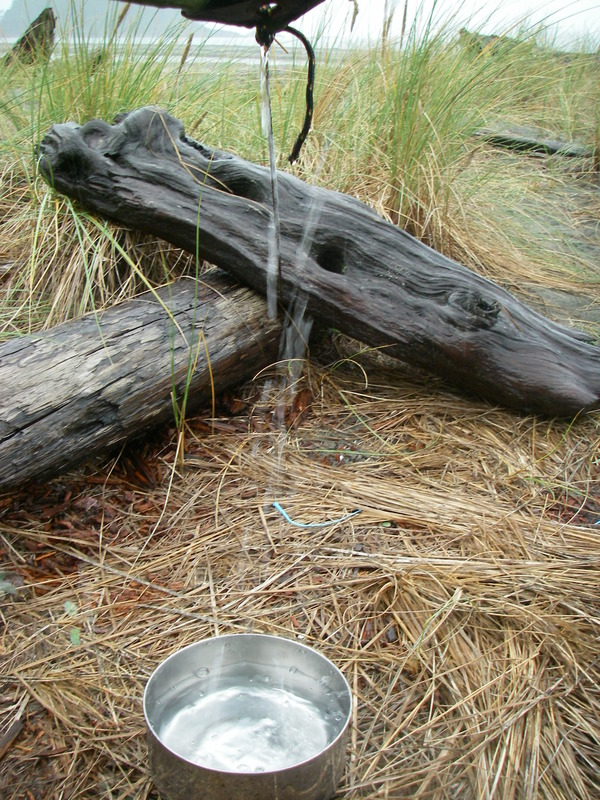 Your camp should be shaping up by now and while you are waiting for your coffee to brew take the moment to change out of your wet paddling gear and into dry camp clothing. It is important to maintain a dressing regime of separating paddle clothes and camp clothing. The mistake is wearing your camp clothing outside of camp, getting them wet and now you have nothing dry as back up. Rain gear over top will do nicely and you will be comfortable while enjoying the reward of that tea or coffee, or soup. Settling in, there is still much to do to prepare for a stretch of rainy weather. More practice at home is in building a campfire. It seems a simple enough task doesn’t it, but in a rainfall day with any wind coming in to shore this can become a daunting job. There are several methods for making fire starters. Do some experiments at home to find the way you prefer. The fire is something good to have while killing rainy hours. Firstly, it sets a tone in camp and gives you or members of your group the occupation of scouting out best bits of wood to use. Wet driftwood is a pain to ignite and so I bring with me a small stuff sack filled with dry wood, twigs and kindling pieces crucial to getting that infant set of embers glowing. Nurse that little fire until it is working well and set up your wet wood as a surround to help protect the fire from winds as well as aiding in the drying process. This activity alone has kept me occupied an entire afternoon as the rain tap-tapped on the tarp overhead. Secondly, that campfire will be your TV for the evening. It will keep you warm, entertain you and mesmerize you with its flickering flames with no commercial interruption. Make sure beforehand that your basic camp supplies are where you want them and packed in the order of need. Clothing is something we take for granted but having the right stuff to wear is important. Most of you will know already the dangers of using cotton. It gets wet, and it stays wet which draws heat from your body and can lead to hypothermia. Synthetics for all-weather, and woollens are great because even if they get wet, you stay warm. Ever see a shivering sheep, noop. Other things to have on hand inside your tent and always in waterproof bags are toiletries, a butane lighter or strike anywhere matches, headlamp, lantern, and a good book. I bring my cell phone which is in a waterproof case but as an extra bit of insurance I put it in a ZipLoc bag as well. As for footwear I have a pair of shoes to wear around camp. Most often I stick to sandals unless it is colder. These come in the tent with me at night and my water shoes hang out in the vestibule. For any trip into the outdoors, and for times when the weather is not great it is important to know for certain that your stove works! The last thing you will want to discover is a stove failure. Sure, you can always cook on that campfire but what if you can’t get that going? That stove is your safety net. Make sure that your fuel is new and that you have an ample supply. Going OCD at this point is perfectly acceptable. Give the stove a few starts to make sure all burners are working. With your camp set up, and the firewood stacked, and the rain pouring down it is time to go sulk in your tent. But wait one minute! Did you notice the trails near your camp, or maybe there is a big beach to comb. It is time to wander about and a little rain should not stop you from exploring your surroundings. The final tip is this, go anyway. Rain or shine it is an adventure you are after and the real meaning of adventure is that they don’t always go as planned, and that is the point. But with a little forethought and planning you can hit the camp running and be warm, dry-ish and comfortable until the weather gods smile upon you with some clear blue skies and sunshine.